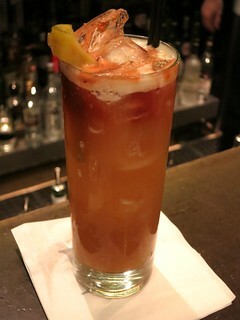 This is Ackley's take on a tiki drink. High alcohol content but less sugar and more bitterness thanks to the pilsner. He wanted a cocktail that was "boozy and refreshing". He didn't want all his spring drinks to be light, but rather to have something with more substance that you can still drink on a hot day. Partitioning the menu is perhaps the simplest drink on the menu: Scotsman: Dewars scotch, Maraschino liqueur, honey syrup, lemon, mint. This is a play on the classic cocktails scotch smash. 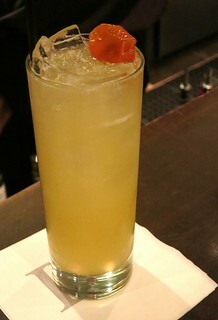 I'm a big scotch in cocktails fan, though, and this is a great simple drink to go with. 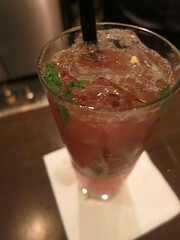 After that we get into some very interesting cocktails. 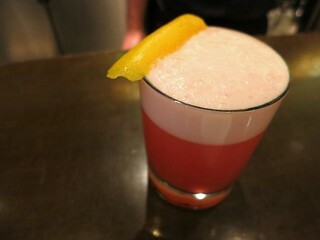 The Nicolina is made with Casa Noble reposado, plum jam, lemon, rosemary, and a float of Cabernet Sauvignon. 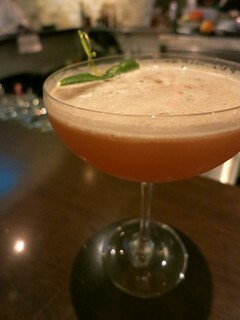 He made this drink because his firlfriend told him to use plum jam in a drink. The first sip gives you the wine, then plum, then tequila. He also asks you to adjust the dryness by using the rosemary to stir. Tasting the menu so far, this was my favorite drink, both sweet and complex, but there's more to come! 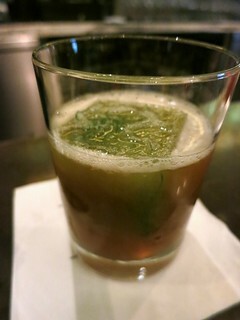 Il Cocciuto: Bulleit Rye, Cynar, ginger syrup, lemon, bitters, pickled artichoke. Pickled artichoke? I was kind of wary of that but it actually reminded me of ume, and it makes sense since Cynar is predominantly artichoke-based. I personally loved this one although it's probably not for everyone with the vegetal notes. The fennel ice cube is as you can see, an ice cube filled with fennel fronds and made with 1 part water, 1 part fennel extract. 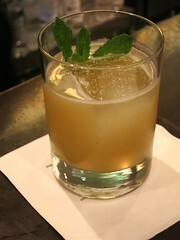 The cube releases more fennel aroma and notes as the ice melts, so the drink gets better as it sits. I love smelling it! Surprisingly, Ackley tried making this with eight different bourbons and liked Jim Beam the best. There's a little thick sweetness from honey syrup but the balsamic reductions cuts it. What the hell is a wood syrup? That's what I asked too! He made a demerara syrup with mesquite. 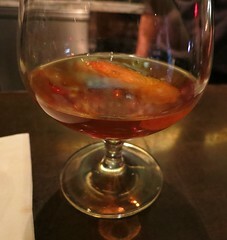 With this, the mescal, and the particular bitters he uses, this is one strong, smoky cocktail! 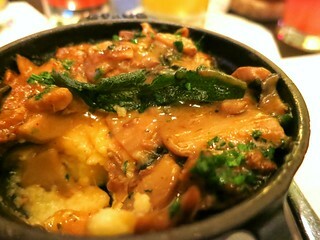 Can't go wrong with polenta and mushrooms. Did I mention that Drago Centro has an awesome all day happy hour menu, with plenty of cheap food options like $4 margherita pizza? 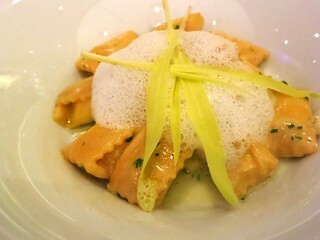 Later on, the chef also sent out some sweet corn agnolotti. I love sweet corn and always look forward for sweet corn agnolotti to make it back on menus all over town. I guess that time is now. 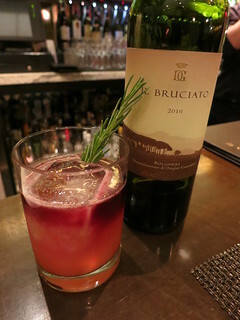 This is my first time having this at Drago Centro and it is lovely. The subtle sweetness of the corn really comes through. Without the constraints of pleasing the Hollywood crowd, Kyle Ackley has more freedom to play at Drago Centro. Pickles, fennel ice cubes, wood bitters are only some of the unique things you'll find here. 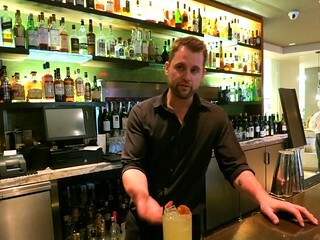 His cocktails are "fancy" but most of the work done in the prep, while employing simple techniques during service so that it's fast, smooth, and consistent. I'm looking forward to see what he would create next - in the meantime, though, go check out the fun spring cocktails.